Boil the eggs. (8 minutes for wax-stage/10 minutes for hard-boiled). Cut into wedges. Blend all ingredients for the dressing in a blender. Season tuna with salt on both sides. Crust the tuna with sesame seeds on all sides. Sear the tuna for 30 seconds per side. Slice the tuna into ¼” pieces. 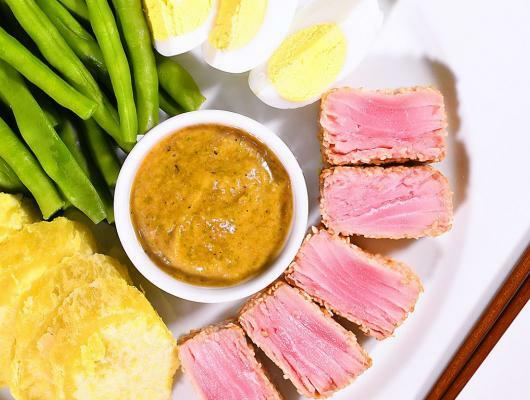 Arrange sweet potatoes, eggs, green beans, tuna slices, and dressing on a platter. This Nicoise Salad is a beautiful play off its French counterpart. It keeps the traditional string beans, potatoes, boiled eggs and tuna, but it adds an Asian inspired dressing that elevates this salad to the next level. By changing the usual white potatoes to sweet potatoes, it becomes a healthier version of the recipe. Sweet potatoes provide more vitamins and minerals than regular potatoes and they have fewer calories. Add in the Omega-3 benefits in the tuna, the protein of the eggs, and fibre-packed beans, and you have got a power packed lunch that tastes like a million dollars. This recipe will certainly be singing to your taste buds tuna.